2019 has started and so the all growers were invited for the yearly New Year’s reception on Saturday January 26th. Plans about how to grow the biggest pumpkins this year where discussed while having a beer. Exactly 1 week after the official Belgian weigh-off, we went to Ludwigsburg (Germany) for the European weigh-off. Again, Jan Biermans took the first place. However, this time he needed to share his place with Stefano Cutrupi from Italy, as both gentleman grow a pumpkin of exact the same weight: 965,5kg. Well done! Also on Saturday October 6th, the normal big pumpkins were weighted (next to the squashes). 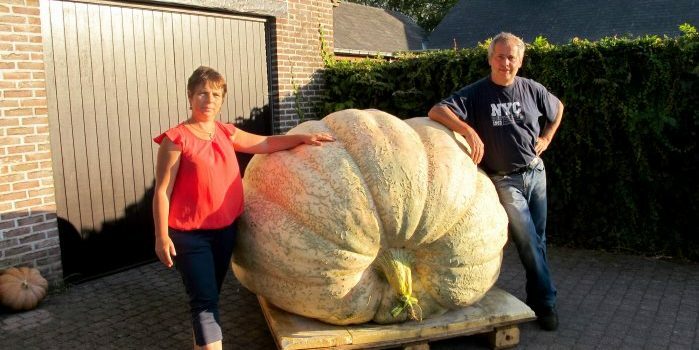 Jan Biermans succeeded to grow the biggest Belgian pumpkin of 2018 with a weight of 970,2kg. Place 3 was also a grower from our club, Marcel Dierckx, with a weight of 851,3kg. After years of growing real big pumpkins, one of our growers finally succeeded to grow a pumpkin heavier than 1000kg. However, sadly enough the pumpkin started to rot. With a lot of pain, Herman needed to stop growing his big proud. It was weighted 1010kg. Hopefully he can grow at least the same weight in 2019 (he knows what to do). At the last Saturday of August, we went to some of the big pumpkin growers to estimate the weight of their pumpkins. The heaviest pumpkin on Saturday August 25th measured, had a weight of 850kg. Let’s go for 1000kg or more! The day ended, like always, with a nice BBQ. October 16th 2016, the day of the pumpkin weigh-off in Kasterlee. Mathias Willemijns won with a pumpkin of 922,5kg, followed by Luc Berrens with 810,6kg. During the European weigh-off in Ludwigsburg, Luc Berrens became 3rd (our colleaugue Mathias Willemijns had a giant of 1190kg, good for a new world record). However, on Saturday 15/10/2016 we loaded all pumpkins from the growers in Kasterlee. On Sunday October 16th during the weigh-off in Kasterlee we’ll see which one is the heaviest of Kasterlee.